The New Canon imageRUNNER ADVANCE 6565i is now available and is a simple refresh and update of the highly succesful iR Advance 6265i in a new Platinum White finish. The New Canon iR ADV 6565i features some new standard up to date items which previously would have been classed as chargeable extras such as Secure Hard Disc Erase and searchable pdf scan. 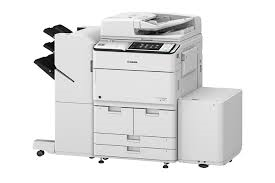 For more information on the Canon imageRUNNER ADVANCE 6565i please call our helpful sales team on 0800 1244 199 or email us.